The situation continues to change hour by hour after the devastation wrecked by Hurricane Maria. The first responders, our government and our fellow Americans have been focused on helping Puerto Rico and the Virgin Islands since before the storms hit. This is an enormous and unprecedented situation on top of two other US states that are still in recovery mode. The reality is that no other country or national government would be as able to respond to such devastation in a short amount of time in three different places with this level of resources, personnel, preparation. The top priority of the federal government is pushing forward to provide life safety and life sustaining resources to the people of Puerto Rico and the U.S. Virgin Islands. It has been ten days since the storm’s landfall, we were here when the storm hit, and we will be here throughout the response and recovery. We will be satisfied when power and routine return to Puerto Rico and the U.S. Virgin Islands. We remain committed to put forth the full effort of the federal government to overcome the complex challenges requiring a phased approach to the delivery of personnel, resources, and equipment to move the resources and lodging for responders. All municipalities in Puerto Rico and the U.S. Virgin Islands have been reached. FEMA and its federal partners have cleared debris to gain access to ports, airports and roadways; and at the same conducted search and rescue operations, assessed hospitals, and moved meals and water onto and around the island. It will take time to get power restored to many areas, but work is underway between the U.S. Army Corps of Engineers, Department of Energy, local power authorities, and the private sector to get power restored in Puerto Rico and the U.S. Virgin Islands. Trucks are leaving ports and airports to deliver commodities to regional staging areas and points of distribution throughout Puerto Rico. FEMA Urban Search and Rescue (US&R) teams covered 100% of the islands. FEMA US&R task forces saved or assisted 843 individuals, while searching over 2,600 structures. Power is being restored to hospitals, and all hospitals assessments are complete. In Puerto Rico, 59 hospitals are operational to care for current patients, or receiving patients, with one fully operational. One Department of Veterans Affairs hospital is open, and five are open for walk-ins. Drinking water is being restored. The U.S. Virgin Islands Water and Power Authority drinking water system is back online, and 45% of customers in Puerto Rico have access to drinking water. In Puerto Rico, 50% of the major roads are cleared of debris and open. Most highways on St. Croix are open with caution. In Puerto Rico, 49% of grocery and big box stores are open, and more than 60% retail gas stations are operating. These openings are crucial beginning steps in Puerto Rico’s recovery from the devastation of Hurricane Maria. For updates from Puerto Rico on the operational status of hospitals, food and water distribution centers, gas stations, dialysis centers, supermarkets, and other information, please visit: www.status.pr. There are more than 11,800 federal staff representing 36 departments and agencies, including more than 800 FEMA personnel, on the ground in Puerto Rico and the U.S. Virgin Islands engaged in response and recovery operations from Hurricanes Maria and Irma. Hundreds of additional federal personnel are supporting response and recovery operations through mainland coordination centers and logistics facilities. The outpouring of support that is being offered from across the nation, combined with the selfless dedication of volunteers shows the compassion and unity of Americans helping Americans. To donate or volunteer for the U.S. Virgin Islands or Puerto Rico, contact the voluntary or charitable organization of your choice through the National Voluntary Agencies Active in Disasters (NVOAD) at www.nvoad.org. NVOAD is coordinating closely with the Puerto Rico Governor’s Office on offers of assistance. To make a cash donation directly to the Commonwealth of Puerto Rico, visit www.unitedforpuertorico.com. Centro Médico Hospital in San Juan is serving as a central designated medical facility, with seven regional hubs for medical support. A mobile hospital is activated, expanding patient capacity. Assessment of the Myra Keating Medical Facility on St. John is complete and repairs to this facility are a top priority. The Governor Juan F. Luis Hospital in St. Croix is established as a mobile hospital and the Schneider Regional Medical Center in St. Thomas will resume patient services in the coming days. More than half of dialysis centers in Puerto Rico are open and accessible for patients. More critical care facilities will re-open in the coming days as power and access are restored. Medical evacuations continue from the U.S. Virgin Islands for critical need dialysis patients. Officials in the U.S. Virgin Islands and Puerto Rico opened points of distribution (POD) in Puerto Rico and the U.S. Virgin Islands for survivors to get meals, water, and other commodities. The Governor of Puerto Rico established 11 Regional Staging Areas around the island, serving all 78 municipalities. The Governor of the U.S. Virgin Islands announced that six locations in St. Croix are open Saturday from 12pm to 4pm. 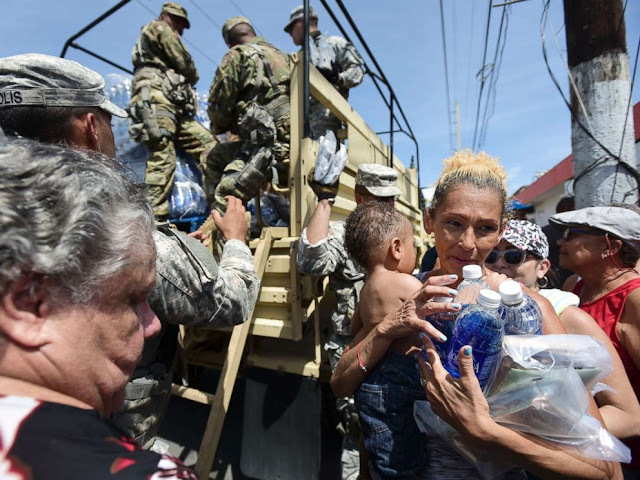 FEMA, working in coordination with federal partners, provided millions of meals and millions of liters of water to Puerto Rico and U.S. Virgin Islands. Additional meals and water continue to arrive to the islands daily via air and sea. Mobile Emergency Response Support (MERS) communications assets and personnel continue to support the FEMA Incident Management Assistance Teams (IMAT), Urban Search and Rescue (US&R), National Disaster Medical System (NDMS), and other federal teams in Puerto Rico and the U.S. Virgin Islands. There are more than 30 MERS personnel in Puerto Rico and more than 20 MERS personnel in the USVI. A U.S. Coast Guard (USCG) mobile communications team is in Puerto Rico to help improve communications across the storm-impacted area. Mail service returned to Puerto Rico Friday through the United States Postal Service. Limited handout mail service began Friday at 49 locations in Puerto Rico. Forty-one of these locations are also able to provide postal retail services. Limited handout mail service, along with limited retail service, begins today in St. Croix. Limited mail service continues in St. Thomas. On St. John, limited mail service continues. The Department of Defense (DoD) continues to operate from Roosevelt Roads Airfield, executing route clearance, commodity and fuel distribution, as well as providing helicopter support to assist officials from Department of Health and Human Services (HHS) complete assessments of all Puerto Rican hospitals. The use of medium lift helicopters allows for the flow of needed commodities such as food, water, and fuel to remote areas disconnected from traditional supply lines. Six additional medium lift helicopters arrived in Puerto Rico yesterday to continue commodity distribution to affected areas. The U.S. Virgin Islands Water and Power Authority drinking water system is back online, and other drinking water systems on the islands are top priority for receiving generators. Additionally, the Concordia potable water pump station is online in St. Croix. The U.S. Virgin Islands Water and Power Authority Waste Management, and USACE are addressing potential public health risks of garbage build up; coordinating route clearance of wires and poles to enable garbage haulers to access the St. Thomas landfill. The National Guard Bureau (NGB) has thousands of Guard members on the ground in Puerto Rico and the U..S. Virgin Islands taking part in security and support operations. The Air National Guard is focused on transporting food, water, and communications capabilities as well as rapidly increasing airlift into affected areas. The U.S. Virgin Islands territorial governments and FEMA confirmed the territory will execute St. Croix debris removal mission with local contractors; USACE Debris Teams will continue to provide technical assistance. St. Croix and St. Thomas report adequate fuel supply on the islands for power generation and response efforts, including gasoline, diesel, and propane. USACE temporary power response teams are on the ground in Puerto Rico and USVI, assessing power needs and installing generators at critical facilities. Teams have completed more than 170 inspections, and more than 200 assessments have been requested for facilities. Generator installations are underway in both Puerto Rico and U.S. Virgin Islands, with 20 installations completed. The National Business Emergency Operations Center (NBEOC) is working with private sector companies to reach additional truck drivers throughout Puerto Rico to enable commodities to reach more remote parts of the island. The NBEOC is working with government and private sector entities to aid in the response to Hurricane Maria. Federal forces and more than 200 federally-supported contract personnel are supporting the Puerto Rico Department of Transportation with clearance of debris that prevents access to major roadways. The Federal Highway Administration (FHWA) made $40 million available to the PR Highways and Transportation Authority (PRHTA) for emergency relief work to impacted roads. Emergency Relief work will consist of the stabilization and repair of impacted roadway embankments, reconstruction of damaged roadways, safety guardrails, lighting, the repair/replacement of the traffic signal devises, and highway signage. 26 chainsaw teams and one Incident Management Team (IMT) from the Department of Agriculture United States Forest Service are in Puerto Rico conducting emergency road clearance with U.S. Army Corps of Engineers (USACE), Department of Transportation (DOT), and Puerto Rico Emergency Management Agency (PREMA).. A fourteen-person team from U.S. Fish and Wildlife Service is supporting debris removal and tree clearing to restore road access in Vieques. U.S. Army Corps of Engineers (USACE) debris experts are assisting FEMA with debris management strategies in Puerto Rico, along with the Environmental Protection Agency (EPA). The federal government is working with its interagency and private sector partners to support availability, transportation and delivery of fuel, based on priorities identified by Puerto Rico and the U.S. Virgin Islands. For those in declared areas who are able to do so, registering online, at www.DisasterAssistance.gov, is the quickest way to register for FEMA assistance. Assistance can include grants for temporary housing and home repairs, low-cost loans to cover uninsured property losses and other programs to help individuals and business owners recover from the effects of the recent hurricanes. Registrations and searches can be done directly on the website. To speak with someone at the American Red Cross concerning a missing friend or relative please contact 1-800 Red Cross (1-800-733-2767). The American Red Cross Emergency App features an “I’m Safe” button that allows users to post a message to their social accounts, letting friends and family know they are out of harm’s way. The app can be downloaded for free in app stores by searching for “American Red Cross” or by texting ‘GETEMERGENCY’ to 90999. Anyone who finds a child who may be separated from parents or caregivers, please contact the local police and enter basic information and/or a photo into the National Center for Missing & Exploited Children's Unaccompanied Minors Registry. If you find an unaccompanied child, please indicate whether the child has a disability or has access and functional needs in the appropriate field in the Unaccompanied Minors Registry. If you do not have access to the internet, please call 1-866-908-9570. The USACE Blue Roof program is active in Puerto Rico and the U.S. Virgin Islands. 22 Blue Roofs are installed in the U.S. Virgin Islands to date. FEMA is raising awareness that Hurricane Maria disaster survivors, and their friends and family, should be alert for false rumors, scams, identity theft, and fraud. Remember, if it sounds too good to be true, it probably is. Visit FEMA's Hurricane Rumor Control page to get the most accurate information from trusted sources. All commercial airports in Puerto Rico are operational. Recovery efforts are now supporting more than a dozen commercial passenger flights per day at Luis Munoz Marin International Airport (SJU) in San Juan, Puerto Rico. On 28 September, SJU accommodated 25 commercial flights and processed 5,000 ticketed passengers. Six military/hurricane relief flights are arriving at SJU per day. Roosevelt Roads, Ponce and Aguadilla Airports in Puerto Rico are open for all flights. St. Thomas Airport is open to limited commercial aircraft, and St. Croix Airport is open with restrictions. St. Croix to St Thomas ferry is running Gallows Bay 11:00 a.m. – 1:30 p.m. The National Oceanic and Atmospheric Administration survey ship Thomas Jefferson is assisting with surveying of the port of Ponce. President Trump issued major disaster declarations for Puerto Rico and the U.S. Virgin Islands. Stay off the roads. Emergency workers are assisting people in flooded areas or cleaning up debris. You can help them by staying off the roads and out of the way. Use extreme caution when entering buildings that are damaged. Ensure water is safe to drink, cook or clean with after a flood. Oftentimes a boil water order is put in place following a flood. Is the military in charge of the federal response? Supporting Puerto Rico as it responds to, and recovers from, the devastation from Hurricanes Irma and Maria requires unity of effort. FEMA, DoD, and their federal partners were in Puerto Rico and the U.S. Virgin Islands before Hurricanes Irma and Maria hit. We will be there throughout the recovery from these storms. FEMA’s role leading coordination of federal support ensures we’re able to bring the full force of the federal government to bear. Although it may seem like a clear case for the need of federal support; FEMA and DoD were still Constitutionally obligated to allow officials in Puerto Rico to respond. The FEMA Federal Coordinating Officer (FCO) on the ground is the head of the disaster response unified command structure on the ground, and coordinates closely with the Governor, federal partners, and Department of Defense (DoD) leadership. This ensures the federal, territorial, and Commonwealth governments are able to capitalize on all the assets and resources available. The federal government is working with its interagency and private sector partners to ensure that fuel continues to remains available. The governments of Puerto Rico and the U.S. Virgin Islands are working to prioritize fuel distribution throughout the islands. As of September 26, the U.S. Virgin Islands there is no request for a cost share adjustment for debris removal and emergency protective measures, including direct federal assistance for Hurricane Maria. There has been a systemic problem with airlines at the San Juan Airport (SJU) who are NOT ABLE to ticket or screen electronically (manual only) at this time that is causing huge delays for people who do have tickets and is preventing them from selling any other tickets to prospective passengers. The Federal Aviation Administration (FAA) is talking with airlines now they are aware of this and are now working on a fix but this may cause additional issues moving ahead until it is fixed. The U.S. military is planning to deploy 10 additional ships, including the USNS Comfort hospital ship, to assist with the Federal Emergency Management Agency's (FEMA) response efforts in Puerto Rico. Hurricane Irma applicants from Puerto Rico and the U.S. Virgin Islands who have yet to receive an inspection, will continue to be processed in Irma as most will not realize they would have needed to apply a second time. All damage recorded will be processed in Irma. Any survivor who has yet to apply will be registered in the appropriate disaster by reported date of loss: if they say they were damaged from both storms, their damage will be recorded under Hurricane Maria, go in Maria and all damage will be processed through that disaster.